Foam ear plugs are soft and comfortable, and come in a variety of colors, sizes, shapes and materials. Foam ear plugs are great for sleeping (especially if your someone snores! ), studying, motorcycle riding, shooting, and working or playing in noisy places. 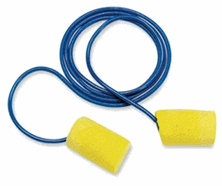 Corded foam ear plugs are especially helpful in preventing your ear plugs from getting lost. Just hang your corded foam ear plugs around your neck until you need them again -- no hassle, no lost plugs. Whether you are an individual or a member of an organization large or small, we let you buy exactly what you need, from a single pair to thousands of pairs. We stock most of the available ear plugs in the market, and in most cases we can special order any that we do not already have on hand. (NRR 30) Hearos SoftStar NexGen foam ear plugs provide the smooth roll-down of a cylindrical (barrel) design, with the softness of PVC-free UF foam. Star indicates proper method of insertion. Smooth skin for reduced irritation. Corded. (NRR 32) Howard Leight X-Treme Ear Plugs are a highly economical hearing protection ear plug with very good noise blocking and a bright orange color to assist with compliance. Suitable for a wide variety of noisy applications. Corded for convenience. One pair. (NRR 30) Designed based on the input of actual workers who use prefer foam ear plugs and who use hearing protection on a daily basis. FirmFit is firmer than most Howard Leight by Honeywell foam plugs, but softer than other classic cylindrical-style ear plugs. One corded pair. (NRR 33) High rating, average to large size fit and the comfort of UF Foam makes Max a favorite industrial plug for high noise environments. (NRR 30) Moldex Mellows® foam ear plugs are made of super soft, lightweight, 100% PVC-free foam in a popular bell shape. This tried-and-true tapered design ensures a comfortable fit, with little to no irritating pressure on the sensitive ear canal. One corded pair. (NRR 33) Moldex Goin' Green® UF foam ear plugs are extra-soft low pressure foam and tapered fit for extended comfort.